A woman died in an Esquimalt apartment blaze after she became trapped in a fourth-floor unit, while horrified onlookers tried to urge her to jump to safety. Smoke billowed into the sky and flames shot from windows when a four-storey building in the 800-block of Craigflower Road caught fire Sunday afternoon. Reports came in of multiple people being trapped on balconies. In a disturbing video taken by witnesses near the apartment, bystanders below could be heard yelling at a woman on a fourth-floor balcony to jump to safety as they set up a mattress and a blanket for her to land on. The woman did not jump and caught on fire, succumbing to the flames. "We made rescue attempts yesterday which were unsuccessful," said Esquimalt Fire Chief Chris Jancowski. "The female occupant was found in the unit. At this point, the loss of life is under investigation of the Victoria police and the coroner's service." A coroner confirmed Monday that a woman in her 60s perished in the blaze and that it was in the early stages of an investigation into her death. Her body was removed from the unit Sunday night by coroners and police. Fire officials thanked members of the public who tried to save the woman. "I think the civilians definitely had the right frame of mind trying to help others in their time of need," said Jancowski. Investigators do not believe the fire was suspicious in nature, but say it was unusual that it grew so large before crews were called. "We don't normally see this type of fire involvement in a daytime fire. We normally receive a lot of 911 calls early on," said Jancowski. "It appears that the fire definitely had an opportunity to grow before a notification to us was taking place." Witnesses in the area saw the chilling sight of the woman on her balcony as smoke poured from the building. "A lady came out of her suite, was on the balcony and she didn't want to jump down so she laid down flat and then we saw flames on her," a woman told CTV News. B.C. 's Deputy Police Complaint Commissioner Rollie Woods, who lives across the street, witnessed the tragedy unfold along with dozens of others. "They pulled out a big blanket to get her to jump, because you could see the flames had come out of the window and were coming quite close to her," he said. "They couldn't encourage her to jump, in spite of numerous people to try to get her to come over the balcony." Neighbours have identified the woman as Judith Burke. Her identity has not been confirmed by police or the coroner's service. 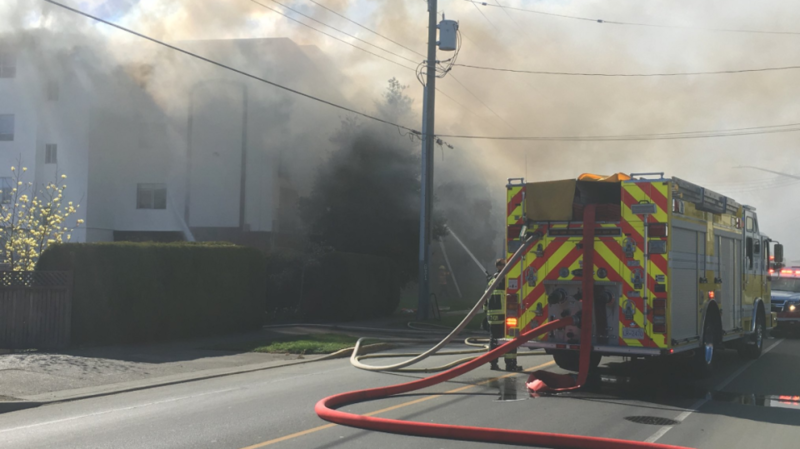 Esquimalt Fire Department called in neighbouring departments for help. One man stood on the roof of his house, aiming a garden hose at the blaze as more crews arrived on scene. Fire crews rescued at least five other people trapped in the burning building and at least one man was seen being treated by paramedics. The cause of the fire has not been determined but investigators say it does not appear to be suspicious. An investigation will be ongoing "in the hours and days to follow," Jancowski said. He said the building had working smoke alarms installed. Due to the age of the building, sprinklers were not required to be installed. All 100 displaced residents from the apartment building have been offered temporary shelter at the nearby Church of Nazarene. "There's definitely going to be all kinds of needs," said Barry Goodwin, a pastor at the church. "There's people on pension there and welfare. It's a low rental area and that brings with it its own challenges." Some residents could remain homeless for days and possibly weeks until the building is deemed safe to return to. It sustained severe fire and smoke damage on the fourth floor on the east side of the building and water damage below, according to investigators. "We're hoping to have re-entry of many people, probably two-thirds of occupants within a day or two," said Jancowski. Goodwin said a GoFundMe would be launched in the coming days to assist displaced people. 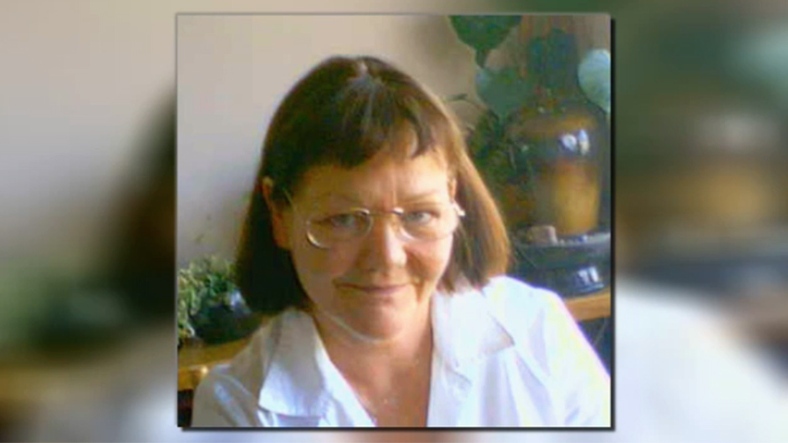 Neighbours have identified the victim of an apartment complex fire in Esquimalt as Judith Burke. Heavy smoke pours from the top floor of an Esquimalt apartment building on Craigflower Road.